The Progress-Focused Approach: Lying - Is it desirable and possible to always tell the truth? Lying - Is it desirable and possible to always tell the truth? Sam Harris is becoming one of my favorite authors. He is the author of The End of Faith: Religion, Terror, and the Future of Reason and Letter to a Christian Nation both of which I did not read (but I bet I would like them) and The Moral Landscape: How Science Can Determine Human Values (which I did read and found very good). Also there are countless videos of talks and debates with Sam Harris on YouTube many of which I have seen and most of which I like. His new book (only on Kindle) is called Lying. It is a small book of only 26 pages with a surprising topic (I found). Harris argues that we can improve our own lives and the world by never lying. Neil deGrasse Tyson, Astrophysicist, American Museum of Natural History, recommends the book as follows: "In this brief but illuminating work, Sam Harris applies his characteristically calm and sensible logic to a subject that affects us all--the human capacity to lie. And by the book's end, Harris compels you to lead a better life because the benefits of telling the truth far outweigh the cost of lies--to yourself, to others, and to society." Research suggests that all forms of lying -including white lies meant to spare the feelings of others - are associated with poorer-quality relationships. Honesty is a gift we can give to other. It is also a source of power and an engine of simplicity. Knowing that we will attempt to tell the truth, whatever the circumstances, leaves us with little to prepare for. A commitment to telling the truth requires that one pay attention to what the truth is in every moment. There are many circumstances in life in which false encouragement can be very costly to another person. False encouragement is a kind of theft: it steals time, energy, and motivation a person could put toward some other person. When asked for our opinion, we do our friends no favors by pretending not to notice flaws in their work, especially when those who are not their friends are bound to notice these same flaws. A commitment to honesty does not necessarily require that we disclose facts about ourselves that we would prefer to keep private [...] The truth could well be, "I'd rather not say." Lies beget other lies. Unlike statements of fact, which require no further work on our part, lies must be continually protected from collisions with reality. When you tell the truth, you have nothing to keep track of. The world itself becomes your memory. You can openly discuss your confusion, conflicts, and doubts. I quite like the proposition of the book. I guess I used to view lying as something which may be unpleasant but sometimes unavoidable. Also, I thought that telling an occasional white lie was not so bad and perhaps sometimes even ethically better than telling the truths. 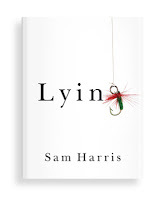 Over the years, my thoughts about lying have shifted in the direction Sam Harris argues for. For example, I recommend never to give compliments which are not sincere. Also, when training managers, I argue for honesty in their conversations with employees. Not only does dishonesty often (always?) work badly, it is also often quite possible to be honest without hurting people or your relationship with them. Reading the book a few incidents came to memory in which I had lied myself. In particular one case in which I had made a transgression of the omission type. I was a junior employee and a senior colleague shamelessly explained to me how he had misled a customer. He thought it was harmless and laughed as he said that this is 'just the way things work'. I remember being shocked and angry and possibly I protested a bit. But I did not go any further. I did not stop the lie or make it public. I guess I justified this by me being just a junior (what did I know?). But I now think I could and should have done more. Question: to what extent do you think it is desirable and possible to always tell the truth? Is this something you would like to become better at? So you got me thinking. It's an interesting idea, but one that ignores some basic characteristics of humans. There are many cases where we don't tell the truth, don't tell the whole truth, or tell useful falsehoods. In many cases we do this because it's adaptive; truth-all-the-time hasn't caught on because we're not rational beings, and facts don't motivate us. I suspect the fundamental problem is that our consciousness and self-awareness are simulations; they are imaginary, and exist as flimsy, shifting, reflection of reality. Humans seem to simulate reality in very predictable ways (what with having very similar hardware to work with), so we can interact with each other and reality in meaningful ways. This means that facts, as you note, are facts, but our relationship to facts is complex. Simulations are represent some aspect of reality in sufficient detail to allow for useful action and often exaggerate and distort the thing being simulated facilitate this. - When a magician takes advantage of our shared simulate of reality to trick us, is it a lie? What about a con artist? - Are artist liars? They intentionally misrepresent and exaggerate and distort reality. Or is imagination a special classification of not-truth that isn't a lie because it's truer than truth? (Yes, I enjoyed writing that sentence.) What about advertising? Propaganda? - Is it a wrong to teach children useful lies? Does your body burn food for energy? Sure, this is true in a poetic sense, but the biological reality is very different. Do planets go around the sun? Not really; bodies in space orbit a common centre of mass. Is the simplification a lie? - What about "stranger danger"? Given the actual causes of mortality in children, I'd say this qualifies as a lie. My daughter is much more likely to be killed by her bed than by someone on the street. If memory serves, she's much more likely to be killed by someone who is NOT a stranger, for that matter. "Fear friends!" and "Beware beds!" don't seem like good rules for a meaningful, fulfilled human life, though. It's also not possible to never lie. Here's one that almost everyone - you, me, everyone - is guilty of every day: invite any group of people, anywhere, to rate themselves as a) below average; b) average; c) above average. Is it a lie to be overconfident when it's part of our nature? Some recent studies show a competitive advantage to overconfidence; others have shown a correlation to accurate assessment of self and clinical depression. Is sanity a lie? Human nature? Assessing risks is another example. I heard a scientist on NPR this week, talking about how teens are not crazy risk takers. They seem that way from an adult perspective because they overestimate danger less than adults do. That's right: overestimate less. We do have ways to control some of the lies we tell ourself and others, but it's not by just telling the truth; it's by building rules and behaviours and checklists to mitigate the risks of untruths. Thank you for your length reply. I deliberately ended my post with as question because I am still thinking about the topic myself. I have not fully made up my mind about it. I like the thesis of the book and it challenges and influences me but I would not say I am am completely convinced it is always best to be completely honest (maybe after thinking some more about it I will be completely convinced, but now I am not). One example I am thinking about is discussed in this post I wrote some time ago: "How honest is it to assume the solution-focused posture?" (http://bit.ly/bDmVoI). it is about not always directly expressing each and every thought and opinion you have because you realize that 1) conversations are not always about your opinions and thoughts and 2) your thoughts and opinions might change fast once you have new information or a new perspective. Anyway, I think you might like the book. It covers some of the topics you mention (like the question of whether magicians lie). I think it's better to avoid rigid-rules such as "never lie" because there may be time when it is useful. I think it's better to examine those times when we are tempted to lie and see if it's useful or not. If lying is not useful in a given context, then we might look for alternative behaviors such as telling the truth. We then have to learn how to tell the truth in those situations. For example, when a person asks for feedback and you know they just want you to tell them that everything is great based on your past experience with them. You can lie and say "your work is fine." And that is easier. But would it be useful to give them accurate feedback when they are not open to it? And if we decide to give accurate feedback, do we do it so that we might help the person or at least not harm the relationship with this person? This is just one example. I think there are solutions to dealing with these situations and I also think that we can stifle our creativity we we hold onto ideas like "always" or "never" doing something. If I have a particular goal, what are more ethical and useful ways of reaching it? Thanks for your interesting answer. I like the phrase: having to learn how to tell the truth in certain situations. I think applying usefulness as a criterion for deciding whether or not to lie is a good one. But I would argue that we would have to look at usefulness in a broad sense. So we'd have to consider not only the short term but also a longer term and we'd have to consider not only are own perceived perspective but also a system perspective. If that is agreed, my prediction would be that it would be hard to find cases in which lying would be better than telling the truth. Having said that, I agree that we must be careful to speak in such absolute terms as 'never ever lie'. Also, let me be clear that, although not lying is something I do strive for, I fall short of that standard more frequently than I would like. Just to be clear, I do think that honesty is more useful in many ways than dishonesty and that the times being dishonest is useful are times when other values are of higher priority. For example, I would easily lie to save my life or the life of another if it were called for. Which leads to my next point, we need to focus on values and sometimes we need to prioritize those values. I will sometimes be honest when it is not in my best interest because I value honesty. But with certain fragile people I know the relationship might be harmed with by telling them the truth about certain things. However, I usually try to find indirect ways of communicating the truth. For example, I had a friend who was "courting" a girl but was doing it very, very slowly. At some point she broke off contact with him and it's possible that she did so because he did things so slowly. I knew if I told him this he would get defensive. He asked for what I thought of the situation and I said, "I don't know" which was not honest. But at a later time I told him a story of how I made a mistake in moving too slowly and lost an opportunity with a girl as a result. He related the story to his own situation without my suggestion. So I felt that he "got the message" although I did not give this story as an answer to his question. I feel this is a more useful way of approaching this particular person that also preserves the relationship and might possibly help him to make a better choice in the future. I value contribution and connection to this person more than honesty so I feel that I prioritized my values effectively in this situation. There are of course other times when I have not acted effectively. Where I was dishonest only because it was more comfortable or I gave my honest opinion when it served no purpose whatsoever and was even harmful. I dashed off my response so quickly I forgot to say a few things. First, thanks for the compliment about my answer. Second, I agree with you that often in the long run honesty leads to better outcomes and that looked at from a system perspective it might be shown to be more useful with one caveat - honesty is more often useful when given a with skill and compassion. I hope that the way I dealt with my friend's question can be considered to be a compassionate response when negative feedback might be useful. Last, I used to ignore bad performance and just put up with it in my organization. Then I had a friend who was having trouble with a person she was training and suggested she read "The One Minute Manager." I then re-read the book myself and realized I needed to give the "One Minute Reprimand" the next time I dealt with someone performing below stated and agreed upon expectations. I did this recently and I have to say it worked very well. So that might be a good example of giving honest negative feedback skillfully and is at least part of an answer to the question of "how to learn to tell the truth when managing a person who has performed below stated expectations."